i'll admit it. i bought one of those straw hats/fedoras i've been seeing on other bloggers' "must have summer fashion" posts (well, a cheaper version, anyway). i still haven't had the courage to wear it outside the house, but i have been admiring it sitting in a corner of my bedroom (and occasionally on my head in front of the mirror). i've been mostly relying on my extensive (some might say "excessive") collection of scarves and homemade bead necklaces for a bit of summer accessorization (if it wasn't a word, it is now). do you read those "must have" posts? if so, what have you been coveting? 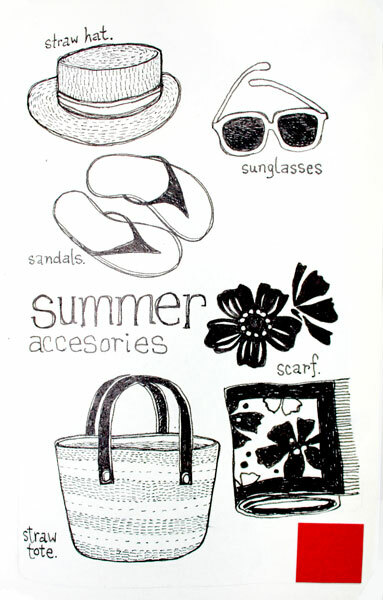 if not, what is your "go to" accessory that gets pulled out every summer? it's hard for me to differentiate between summer and the rest of the year down here. summer takes up nearly 8 months! but i do like 'must have' posts. i'm in the market for a strappy black sandal that can be dressed up or down and must be comfy and have a heel strap (work dress code). i'm too picky though, so will probably be in the market for those for a few years.